For this one I have one more session. That will be a lot of work to tackle still – I only consider the central body part to be final. 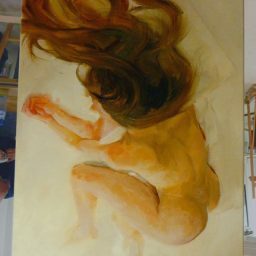 I painted the model in a very different position than she is actually sitting, mixing several perspectives into one – which has me moving around with my easel a lot. 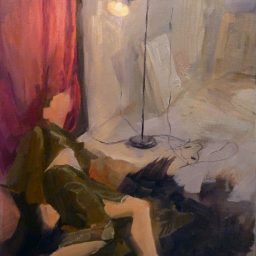 It is unfortunate that I’m limited to the canvas size, it restricts me in my composition. More space at the bottom would have been nicer. Maybe I should start painting on unstretched canvas – it’s a bit less convenient though. I’m scared of stretching cutting and priming (or just too lazy). Anyways I will still have to figure out how to solve the foreground composition – probably will expand the white sheet to the bottom of the canvas. I could work on that even after the coming session. I’ll update after I’m done of course. Comments and critique are welcome.